How many images can I put on my pendant? Can I combine images from different photos? Do you engrave images other then people's faces? How long will my Image Gold order take? All sterling silver and 9ct, 18ct gold pendants will out last you if cared for properly. 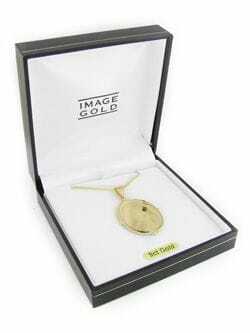 Avoid contact with surfaces that could scratch your Image Gold pendant. Your pendant can be cleaned with a soft cloth in warm soapy water and dried with a clean cotton cloth or use jewellery or spectacle polishing cloths. It is highly recommended that Imaglaze is applied to the engraved surface to protect the image from accidental bumps and scratches. Imaglaze is a clear resin that adheres to the pendant and sets hard (similar to what you see on name badges). Imaglaze comes with a 2yr warranty and can be easily replaced if necessary. Imaglazed products can not be worn in water. We think our record is 8! However, the faces will be smaller, obviously, to fit them all in. Small images will still be clear, but may lose some finer detail and some of the 3D effect. If there is one face on a pendant, it can be larger, and therefore see the detail better. Images can be selected from different photos. With your order, please include clear instructions about the images to be engraved. Eg 'Gran with yellow hat on the left, Pa with glasses and floral shirt on the right'. You don't need to write on, attach stickers or cut out the front of the photos. The image can vary in size from a passport photo to an A4 photo. We will enlarge or reduce the image size to fit your Image Gold product. Yes, we have engraved cars, boats, horses, dogs, cats, budgies, fingerprints, tigers and even dolphins. 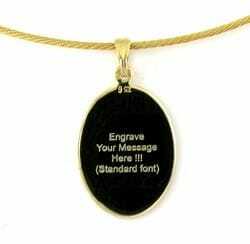 Anything that means a lot to you or someone you love can be engraved onto one of our range of pendants. 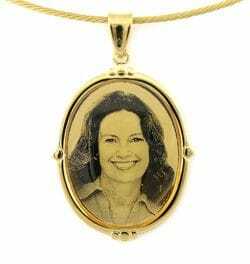 Each pendant comes with one engraved image/face. Each additional image/face are $10.00 each. The back or reverse side can also be engraved** for $20.00 for the first image and $10.00 for every image thereafter. See How many images can I put on my pendant? 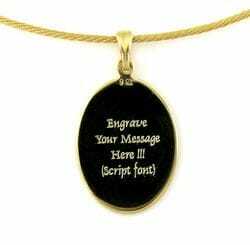 Text can be engraved on the reverse side for $20.00 for unlimited text please specify script or standard text. Adding or removing objects out of the selected image area (ie over the facial area) such as food, hands, hats, hair & other people will incur an extra charge of $10. Please select your photo carefully (See selecting photos) as there will be a re-engraving / reselection charge of $40.00 for changing images after the job is completed. If you are unsure of the quality of your photo feel free to run it past us first (email or post) as we are only to happy to assist in this area. 2. Email to us Contact Us with your contact details. Complete your order details at the checkout including the Image Gold design code, instructions, Sterling Silver, 9ct or 18ct and if Imaglaze is required. We use and recommend you use Australia post - express post for quick, reliable service that can be tracked (1-2 day delivery in Australia). Registered Mail is fine for jobs not required urgently (5 7 day delivery. Add a piece of cardboard to help keep your photo flat. From the time we receive you order until it is sent out will be three to four days. We are generally able to complete you order on the same day or overnight if requested. Other time factors to take into consideration are the postage time which can vary (see Posting Orders).